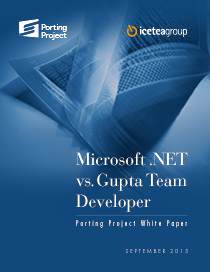 Download our white papers and learn more about our leading solution to convert Gupta Team Developer code, reports, and databases to true .NET solutions. Convert Gupta Apps to .NET Web Apps. 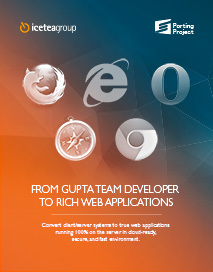 Convert Gupta Team Developer client/server systems to true web applications running 100% on the server in cloud-ready, secure, and fast environments. Read our detailed features table to find out the countless benefits you get by switching to the modern Microsoft .NET platform. Our well designed and extensively tested .NET library includes advanced features not found anywhere else in a single solution. Speed, Reliability, Look & Feel, Superior Productivity, Distributed and Real Web Applications are only some of the incredible benefits that you get by switching from a dated technology to a modern platform preserving your valuable software. 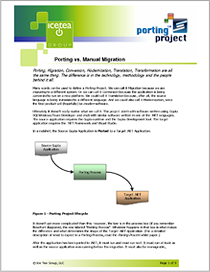 What to expect from the migration process with us. 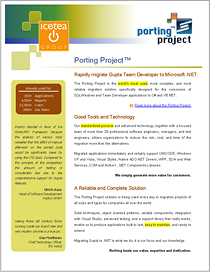 We make the process of porting a Gupta application to Microsoft .NET simple, clearly separated in well defined phases, and easy to manage. The difference is in the technology, methodology and the people behind it all. Porting, Migration, Conversion, Modernization, Transformation, are all ultimately the same thing. Ultimately it doesn’t matter what we call it. 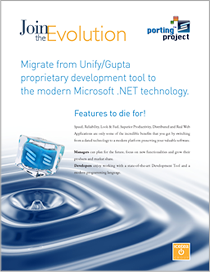 In a nutshell, the Source Gupta Application is Ported to a True .NET Solution. 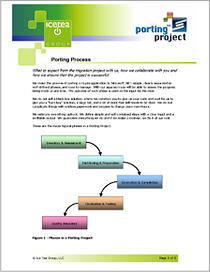 The Porting Project is the world’s most used, most complete, and most reliable migration solution specifically designed for the conversion of SQLWindows and Team Developer applications to C# and VB.NET.